Buddhism is spreading on the world through clear understanding of followers. People are not converted or forced to follow it. They follow it after understanding. If one follows and practices it, one can eliminate suffering and attain full liberation. The Buddha also followed and practiced the same way and attained enlightenment about 2550 years ago. At that time there was one Buddhist who was the Buddha himself. But afterwards he preached his understanding to the five laymen. Then it spread many places in India. Under the principle of spreading the Dhamma without violence (Dhammawijaya), followed by Emperor Dhammasoka, many messengers were sent to nine countries in the world. One of them named Arahath Maha Mahinda Thero, the son of the Emperor Dhammasoka was sent to Sri Lanka in 247AD. After Buddhism was established in Sri Lanka in 19th century, it started spreading to Europe, America, Australia and etc. Some monks from Sri Lankan, Myanmar, Tibet and Thailand, contributed their part of spreading the Dhamma in these continents. 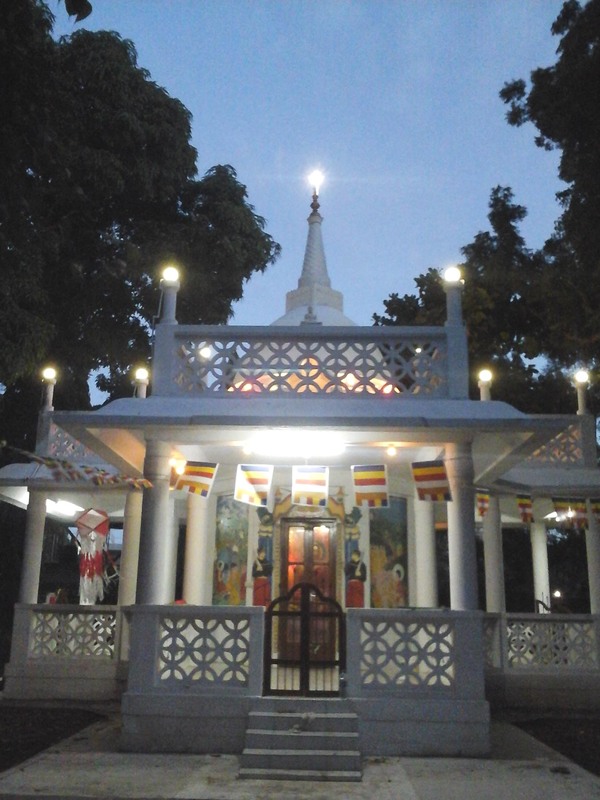 In 19th century, in Africa especially in Tanzania, Sri Lankan people established Buddhist temple after they came to work in Dar es Salaam around 1920. This is the oldest Buddhist temple in Africa. They were about 400-450 people. First Buddhist person came to Tanzania is Mr H. G.Gunapala with Ven Lokanatha thero in 1920. he is the person established this temple in Tanznaia. They worked together and formed “Singhalese Buddhist Association” and then bought a piece of land from the government of Tanzania. then brought a seedling of Bodhi tree (this was the tree under which the Buddha attained full enlightenment) from Sri Lanka and planted it in 1920.It has grown up now covering about quarter acre. The Buddhist Association hall was built in 1927. In those days Tanzania was still under the British protectorate. The association was then registered under the societies in 1945. Not only the Sri Lankan Buddhists who supported the building and maintenance of the Association hall, but also the Sri Lankan Muslims, Christians, and Hindus who worked in Tanganyika that time gave their support. In the past, the association was called the “Sinhalese Buddhist Association”. But it did not include the Thai, Burmese, Chinese, African and other Buddhists hence it was then changed and named as “Buddhist Association” so that all Buddhists and others could come and practice together. This happened on 09th July 1968. Since then it is open to the public to come and do their practice. Even former president Mwalimu Julius K Nyerere also offered Dana (food) for monks in the temple. There was no any Buddhist monk in Tanzania or in Zanzibar until early 1960s. In 1962, Venerable Palane Narada Thero was the first Buddhist monk to go to Zanzibar for a short visit. In fact, he was the first Buddhist monk to come to Africa. From Zanzibar he then visited this temple as well. After the Zanzibar Revolution in 1964, all the Buddhists in Zanzibar moved to mainland (Tanzania). Since the establishment of this temple there was no resident monk until 1983. In Buddhism we have three most respectable and sacred things. The first one is Pagoda/Chetiya/Dagaba, second is Bodhi tree and third is Buddha’s statue/shrine room. The Buddhist community in Tanzania discussed on what should be firstly be done in order to make this place more sacred. Then they decided to bring a seedling of Bodhi tree from Sri Lanka. In 1920 AD it was taken from Anuradhapura City of in Sri Lanka by late Mr Gunapala and brought and planted to Dar Es Salaam Tanzania. The mother tree was brought to Sri Lanka by nun Arahath Sanghamitta therie from India. That is the one branch of main Bodhi tree where Gautama Buddha attained full Enlightenment. The tree is now big in such away it covers almost a quarter of an acre. It is now (2008) 88 years old. Since then it never bear seedlings until 2002 when the seeds germinated to seedlings. Some of these seedlings were planted in other parts of Tanzania like Butiyama (former President Nyerere’s home), Morogoro and Botanical garden, where other seedlings were planted in other African countries like Kenya, Malawi, Botswana and South Africa. The old building was completed in year 1927. It has two rooms, sitting room and kitchen. In those days the country was called Tanganyika which was a British protectorate. She got her independence from the British on 09th December 1961. In 1964 Tanganyika and Zanzibar united to become Tanzania. 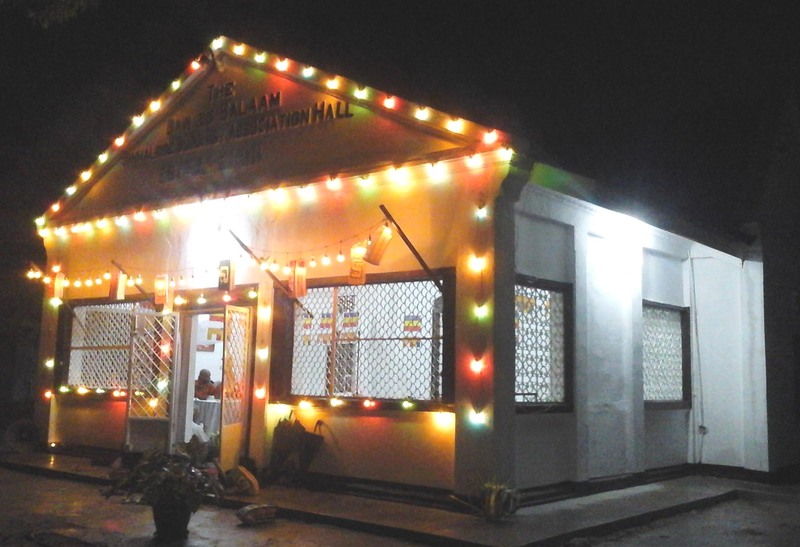 Sri Lankan community used this hall for their social meetings; religious services and other activities. Until 1956, the devotees used the old association hall as a shrine room. 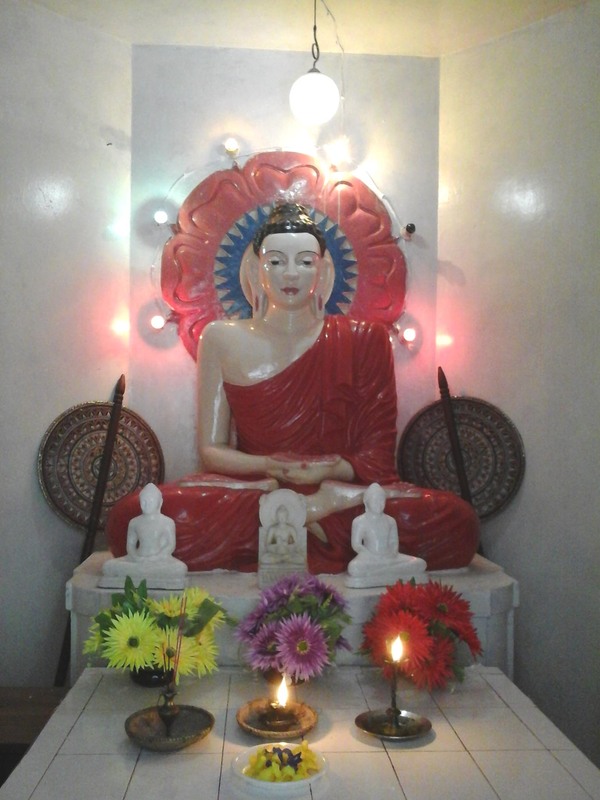 After a while they started collecting donations for building a shrine room, a pagoda and The Buddha statue. It was a grand and expensive project for that community. In the same year of 1956, they succeeded to build a pagoda and a shrine. The process of building multipurpose hall began in 1984 when Venerable Devalegama Dhammasena and Venerable Badigama chandaloka laid the foundation stone. They finished the first 1984 which was the residents for the monks. In 1996 Venerable Ratwita wimalajothi started building the main hall. It was completed by Rev Dr Ilukpitiye pannasekara – The chief monk for the African continent in year 2000. Many donations came from Nan hua Chinese Buddhist temple, which is in Bronkhorstspruit South Africa, under master Hui Lee. He donated more than 20,000 US Dollars and building materials. The length and the width of the hall is 100 x 45 feet respectively. It is now used for meditation classes, Yoga classes, meetings and other activities. Since then until 1983 there was no resident monk. All religious functions and other activities were arranged by devotees themselves. In 1982 committee members decided to find a monk. They then wrote to chairman of (WFB) World Fellowship of Buddhists –Dhammaduta committee. The first resident monk to come to Tanzania was Ven Puhulwelle Vipassi thero. He was from Gangarama temple in Colombo. The arrangement of taking him from Sri Lanka to Tanzania were made by ven Galaboda Ghanissara thero and Mr. Albert Edirisinghe .They came with him to Tanzania. This was a very historical moment of Buddhism in Africa and particularly in Tanzania. He stayed here for a year and went to Brazil in North America. The Second monk who came to Tanzania was Ven Witarandeniye kassapa . He also came from Gangarama temple in Colombo .He succeeded to build the wall around the temple and he is now in Birmingham London. 1985 ven kassapa went to Birmingham in the United Kingdom. Up to now he is working there. He has started many projects for helping the needy people. He established International Buddhist Relief Organization (IBRO) doing many relief and charity activities around the world. He started to build new resident for monks and finished before going back to Sri Lanka. He went back to Sri Lanka in 1987. He is now the chief incumbent of Tissamaharama ancient temple in Sri Lanka. Once he went to Botswana to inaugurate the sacred pagoda. He came hear and stayed for nearly one year and went back to Sri Lanka. He is now in Sri Lanka. He was the Chief Incumbent monk of The New Polonnaru Rock temple in Dehiwala Sri Lanka. After receiving invitation from Tanzania Buddhist association, in 1993 came and stayed here for a while. During his stay he also visited Zambia, Botswana and other countries. He went back to Sri Lanka in1994. He made all the arrangements for Chief monk Rev I Pannasekara to come to Tanzania. Few Thai people who live around the Buddhist temple decide to find a Thai monk for a while. After discussing with committee members they brought a monk from Thailand. He stayed here few months and went to Sri Lanka. While he was here, he managed to visit other countries. Once he went to Botswana and laid down a foundation stone for the pagoda of the Botswana Buddhist temple. Now he has his own temple in USA. He came in 1994. The arrangement for him to come to Tanzania was made by World Fellowship of Buddhists. He stayed In Tanzania up to 1999.while he was in Tanzania he started to sending Tanzanian students to African Buddhist seminary in South Africa. At his time he carried on building multipurpose hall and started nursery school for neighbor children. He also traveled to Kenya, Malawi, south Africa, Zambia to attend some religious services. The arrangements for him to come to Tanzania were made by Venerable Wimalajothi. He stayed few months here and went to teach at the African Buddhist seminary in South Africa. After few months then he went back to Sri Lanka now he is living in America. He came to Tanzania during Venerable Wimalajothi’s time. He was brought here to assist the resident monk with other duties. He stayed for nearly two years and went back to Sri Lanka. Currently he is living in Sri Lanka. Chief Monk for the African continent and the twelfth resident monk to Tanzania. Currently he is residing at the centre and is working hard to establish Buddhism in Africa. 1. In charge of Buddhist temple –Dar Es salaam, Tanzania. 6. Making arrangements of sending young Tanzanians to learn Buddhism in South Africa. 8. Running " Chanika Children Selter" for helping needy children in Tanzania. He was a teacher in Sri Lanka and came to Tanzania after all necessary arrangements were made by Rev .I. Pannasekara in 2003. he went back to Sri Lanka 2006. He came to Tanzania 2008. From that year he is continue helping Buddhist community and other people in Tanzania. Also last years he travelled to Kenya and Thailand to attend some religious ceremonies. The monk who ever lives in Dar es Salaam Tanzania has numerous responsibilities to do. He has to travel to other neighboring countries like Kenya, Malawi, Botswana, Zambia, South Africa,swaziland, lesotho,Zanzibar etc. to perform various religious ceremonies, because there are no any resident Buddhist monks up to now. Tanzania Buddhist center is used as the Buddhist center for the whole African continent. He was the first Buddhist monk to the African continent born in Sri Lanka . After learning Buddhism, he started traveling to many countries to propagate it. In 1962 he came to Zanzibar for a short visit. At that time there had a Buddhist association office in Zanzibar. It was at Don Millan’s house. Don Millan was a merchant and jeweler in Zanzibar. From There Ven Narada gave a short visit to the temple. He is a well known monk in Sri Lanka. He is living in the Gangarama Buddhist temple in Colombo Sri Lanka. He was supported by WFB – Dhammaduta committee to send monks to Tanzania Buddhist temple. He also came with the first monk and stayed here few days and went back to Sri Lanka. But after a while he came again while Ven Devalegama Dhammasena and Ven Badigama Chandaloka were here. He came and ordained one Zambian young man named Edvin Nawa who became a Buddhist monk. After few days he went to Sri Lanka and India. So far do not know where he is. He is a friend of Ven Wimalajothi. He just came to Visit Tanzania and went back to Japan. He is the founder and first Director of Nan Hua Chinese Buddhist temple in South Africa. He is traveling to many African countries one of which is Tanzania. He came here in 1998. When he saw this oldest center decided to help, develop and protect it. He donated more than USD $20,000 to develop the center. He is a Chinese monk who came to Tanzania for student recruitment. He was the dean of students at the African Buddhist Seminary in South Africa. He is a Chinese monk living at Nan Hua Buddhist temple, Bronkhorstspruit in South Africa. He came recruit Tanzanian students to enroll at African Buddhist Seminary. He came with Mr Harold Lemke who is now called Ven Ben Kong who has returned to United States of America. Ven. Hui Fang is now the abbot of Nan Hua Temple and director of African Buddhist African. He is also a Chinese monk from Nan Hua temple in South Africa. He came here twice for students’ recruitment. He was traveling through Africa and made a short visit to this temple. Ven Pannasekara met Ven Vietnam in Thailand in the year 2000 while attending a WFB meeting in Thailand, he, Ven. Buddhadathu, wanted to pay a visit to Africa. After inviting him, he came to the temple and stayed for nearly a month and went back to Singapore. This was the assistant monk to Ven Buddhadathu at that time. Both of them came to this temple at the same time. He is a Sri Lankan monk currently living in Geneva Switzerland. He traveled with Buddha’s relic which was offered to the United Nations from Sri Lanka, Burma and Thailand. While doing this, he then received invitation from Rev I Pannasekara to come to Tanzania and in August 2003 he managed to come. He stayed for three days he went back to Switzerland. He is a very famous Tibetan monk living in Italy. He has many branches in other countries. He came to Tanzania with Buddha’s relics on 02.08.2003. After two days he left. In this center we have a nursery school for African children. It is a special project helping African community. No any religious based teachings in the nursery syllabus. The medium language is English. The age for the kids is from two and half years to six years old. We give library services to others on demand. Any body can get books for reading in order to develop their knowledge. From time to time resident monks go to Secondary schools and universities to give talks about Buddhism. From 1996 up to now, we have been sending Tanzanian students who have completed advanced level (matric) education to African Buddhist seminary, which is under the Nan Hua temple in South Africa, to learn Buddhism for three years. A total of nearly 150 young Tanzanian matriculants have been sent to South Africa to study Chinese Buddhism over the past six years. Those who passed the examination well could go to Taiwan for more few years in Buddhist studies. It is their decisions whether to become monks or not without any obligation from the seminary. 1. Africans still do not know much about Buddhism. More practical activities have to be done for them to understand about this new philosophy. Much have to be done for them irrespective of their color or tribes. Because of that we have to improve our social services. 2. We have to add more and valuable books in the library and improve other facilities. 3. Every Sunday there is meditation class. Nearly 15-20 students attend. We can improve it to get more students. 4. We have a nursery school for local children. We can add more facilities and if possible we can provide free education to these children which will be of a great help since primary education is now free. 5. Every day many people die from HIV and Aids. We can arrange some counseling programs at the temple premises to decrease the misery. 6. No free medicine and free health services. We can arrange any kind of service to help needy people. 7. In rural areas there are no good facilities like drinking water, houses, food, clothes, schools and other important things. 9. There are fifty four (54) countries in Africa but temples are only in Tanzania, Botswana, Kenya and South Africa. In South Africa there are Chinese temples. We have to try to establish temples in each and every countries and make local monks every where. Without local monks Buddhism will not go through Africa. Arahath Maha Mahinda thero’s action should be taken as an example. He came to Sri Lanka and made local monks.